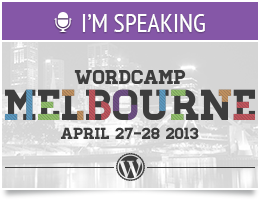 Last week I had the pleasure of attending WordCamp Sydney 2012 and presented for the first time in a while. It was on a subject near to my heart, inclusive design. The biggest thrill for me was being able to present early and against someone I though would claim the entire crowd, Kimanzi T Constable who was following the keynote in the larger lecture hall. I still had a decent and enthusiastic crowd who posed some good questions. It was great to get the preso over at the start of the conference so I could relax and enjoy the rest of the conference, which I did, thoroughly. The entire event is archived at Eventifier, which is well worth investigating in itself, as it collects public traces of your event through the content shared on twitter via hashtags, and there are better writers than I who chose to write about the presentations they saw there. This entry was posted in Accessibility, Community, Design on July 26, 2012 by Joe Ortenzi.